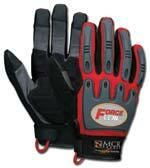 MCR Safety Inc.'s Professional Grade ForceFlex ZB100 glove features Zoombang® technology designed to increase comfort while providing protection from impact and vibration. The Zoombang polymer is soft and fluid-like to the touch. Upon impact, it stiffens into a solid state for maximum protection. After impact, the polymer returns to its original state.